Last week’s Megatron tattoo prompted Kevin to send an electric mail to my internets mailbox address with some photos of his double-barreled* Transformers tattoos. * “Double-barreled” refers to the fact that he’s got the tattoos loaded on both of his arms, or “guns.” You’d know this lingo if you were all big and manly like I aspire to be one day through the power of positive thinking and chemical enhancement. I’ve been a lifelong Transformers fan (still collect the toys, comics, etc. and have a pretty sizable collection and have been to a couple conventions, meeting a bunch of people associated with Transformers over the years) and had always wanted TF tattoos, so once I turned 18, I started doing it. 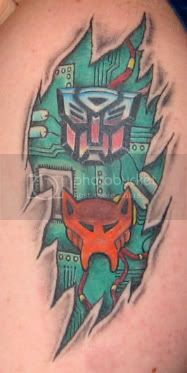 So, he had the “under the flesh” background with the Maximal and Predacon insignias done shortly before Botcon 2007, which I can only assume is a convention for people slowly converting themselves into robots. I hope Kevin had them fooled with his painted-on circuit boards. The original […] tattoos were done by Garth Ennis Hixon from Magic Touch Tattoos in Utica, MI. The additions (plus touchups[…] to the originals) were done by Tony Sciarra of Tattoo Factory West in Ledgewood, NJ. I had conceived the original idea of the circuit boards and everything[…]. Thankfully, Tony’s a hella talented artist and really brought my ideas to life. His Transformers tattoos even propelled Kevin onto the Hasbro Web site. My tattoos were even very briefly shown on Hasbro’s website during some of their video footage of Botcon 2007 – they were recording people leaving the theater following the premiere of the feature film and I, with my sleeveless shirt, was caught celebrating on camera. Pure geekiness, but awesome nonetheless. Right, but let me address a minor grammatical issue with your use of conjunctions and conjunctive adjectives: “Pure geekiness, and therefore awesome.” You’re welcome. I didn’t know that “hella” had spread from California to Michigan and New Jersey. That’s hella awful, and I’m hella glad that I don’t have cable, or else I’d see hella kids on The Real World talking about how they’re hella crunked up and stuff. Garth Ennis? The comic book writer? Nope, not the comic book writer. I just realized that I made an error in “Garth” association (thank you, Paul) – his name’s actually Garth Hixon (thank you, Google). Not quite sure how my mind made THAT particular leap. Oops. I don’t believe he still works at Magic Touch Tattoos, but I know he still works in MI according to my sister. Cool tats, I like the concept of ripped flesh showing what’s underneath. Next post: Geek Steal: 67% off The Complete Series of The Wire!